Intent | To create a resilient coating material that is effective against blaster fire and capable of self repairing if not substantially damaged. [ Effective Blaster Protection ] | The nanolaminate plating process is a rather effective and inexpensive process of making whatever surface it is applied to blaster proof. By reducing the heat and impact from one concentrated point of contact across a larger area, the effective penetrating power of a blaster is mitigated as to little more than the hit from a powerful punch. Severe bruising and fractured bones may still apply, but fatal results are usually minimized. [ Self Repairing ] | Assuming that the nanolaminate plating doesn't take consistent hits that would result in its molecules fusing together or being extensively damage, the residual heat restructures the molecules to take their original form. This allows a soldier to take a hit, retreat, allow for their armor to repair itself before taking another hit. Thus repeating its cycle. This applies to whatever surface the nanolaminate is applied to. [ Melee ] | Due to the layers and structuring of the nanolaminate coating, it has been shown that excessive contact with melee weapons or physical objects can result in these layers being 'shaved' off, thus rendering it ineffective. [ Extreme Heat ] | While meant to absorb heat and disperse it across a wider surface area, the nanolaminate armor functions poorly when exposed to extreme amounts of heat, such as sustained blaster hits or contact with lightsabers or plasmatic blades due to the molecules being fused together and diminishing its protective properties. [ Elementals ] | In addition to extreme heat being an issue, extreme exposure to the different elements can have negative impacts on the nanolaminate coating. Exposure to extreme cold can cause it to become extremely brittle and fracture itself beyond repair. It is also susceptible to corrosion and easily corroded when exposed to corrosive weapons or environments. It is also highly conductive, resulting in electrocution if the surface or armor it is applied to isn't properly insulated. Nanolaminate plating is a defensive, matte colored coating material with a multi-layered molecular arrangement that is vacuum deposited on armor or smooth surfaces. At first glance the surface may seem hard, but in principle it's like a very thin cushion with several layers. It is effective against blasters by diffusing and deflecting the fired bolt, minimizing the damage done and thus reducing lethality of a bolt. The nanolaminate armor is also effective against physical projectiles, where its energy bearing molecules can absorb the impact from live ammunition and explosive charges, thereby protecting the wearer's body from damage. It is so effective to the point where ranged firearms can not score decisive hits against them and may only shave off small pieces of it unless at close range. Intent | To submit a heavy weapon emplacement for use by the Sith Empire's Imperial Legion. [ Alternate Fire Modes ] | The EW-ALE has two firing modes; Reciprocating and Link Fire. The Reciprocating Fire Mode utilizes alternating fire between the barrels, effectively doubling up the fire rate. For comparison, it'd be similar to that of a rotary cannon's fire rate, and extremely effective against infantry. The Link Fire Mode, briefly charges both barrels before firing them simultaneously at a target. This increased output is much more effective for dealing with light to medium armor targets, while gradually being able to bring down heavily armored ones. [ Composite Shielding ] | The EW-ALE is equipped with a front facing composite particle-energy shield, giving it a double layer of protection against enemy fire. The deflector shield is positioned in front of the particle shield to catch any blaster related fire while the particle shield is behind to catch any slugs from projectile weapons. This provides the operator with a fairly safe defense from an entrenched position as their entire body could be protected from the front. [ HUD Compatability ] | The EW-ALE is HUD compatible and operatable, allowing the user to keep a close eye on its systems like overheating or power output while also adjusting it while mounted on it. This makes it so that the EW-ALE can be operated and maintained by a single person after setup and does not require a second person to constantly micromanage its systems. [ Setup ] | The EW-ALE is heavy and cumbersome, which is why it requires a crew of two or three people to carry around and deploy. One for the weapon itself, one for the tripod, and one for the power supply and cables. [ Slow Traverse/Elevation ] | The EW-ALE has a slow turning and elevating speed, making it poor for quickly moving to change targets or against fast moving targets. It is ineffective at following after targets while on its mount. The EW-ALE or Emplacement Weapon, Alternating Laser Emplacement is a stationary weapon emplacement that lays out impressive fields of fire against both infantry and armored targets, making it ideal for holding down defensive lines or chokepoints. What it exceeds in is laying down oppressive fields of fire to stagnate enemy advances, both from infantry or armored targets. The EW-ALE like many weapon emplacements requires a crew to set up and deploy, but only requires a single operator once everything is set up due to it being designed for compatibility and operation from a HUD. 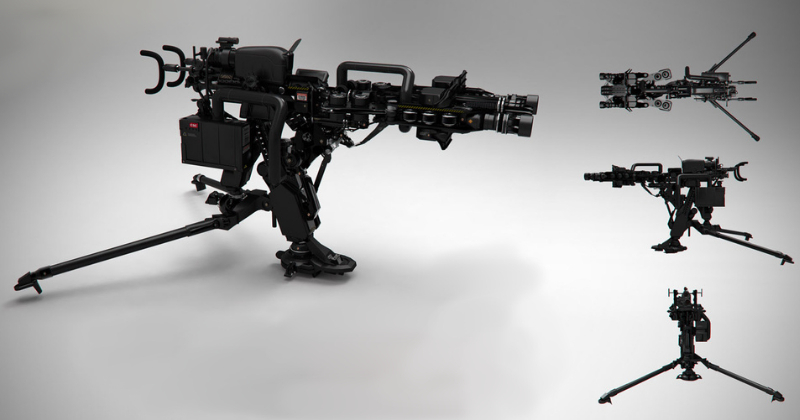 While the EW-ALE technically can function without its mount, it would require a very strong or power suit assisted individual to carry both the weapon and its power source. The EW-ALE has two separate fire modes that help assist in its deadly functions; the reciprocating fire firing alternating shots between its two barrels to fire out a constant stream of laser bolts in a similar fashion to that of a rotary cannon. The Link Fire Mode increases output and fires both barrels simultaneously, outputting heavier firepower at a slower rate to handle armored targets. To improve upon the durability and survivability of the weapon emplacement and operator, the EW-ALE is equipped with composite shielding to help protect the vital upper body of the operator while they are firing, though their legs are exposed. This issue is completely removed if the EW-ALE is deployed in trenches where the ground protects the lower body of the operator. Despite the firepower, the greatest detriment is the mobility of the EW-ALE. In addition to the crew required to carry around and set it up, the EW-ALE suffers from very slow weapon turn and elevating. It more or less requires the operator to predict a fast moving target's path and fire a stream of laser bolts fot that target to run into. This is not so much an issue when the EW-ALE is positioned in a chokepoint or firing indiscriminantly at large groups of enemeies and slow moving targets. Intent | To submit a carbine with the intent of dealing with armored targets, both infantry, and vehicular. [ Destructive Firepower ] | The IL-18A Disruptor Carbine sports an impressive amount of firepower in a compact package. The basic firing mode is a semi-automatic low power carbine that has the capability of punching through most standard infantry armor. Its alternate fire mode possesses significantly more destructive potential at the expense of burning through ammo much more rapidly and at a significantly slower rate of fire. This alternate mode has the ability to punch clean through an armored vehicle. [ Auto Loading Magazine ] | The IL-18A utilizes an intuitive magazine and self-reloading system to go with it. The IL-18A uses 5 separate power cells connected to one another as a magazine, this magazine then goes into the weapon itself. The IL-18A detects when an energy cell has been spent and automatically ejects the spent power cell while loading in the next. This allows for the user to maintain aim without needing to manually reload each cell until the entire magazine has been spent. [ Limited Ammo Capacity ] | Though powerful, because of its nature as a disruptor, the energy consumption of the IL-18A makes it burn through energy cells fast, even more so if it uses the alternate fire. [ Slow Fire Rate ] | Though it was designed to be a semi-automatic carbine, the IL-18A suffers from a slow fire rate as far as semi-automatic weapons go as it requires a brief cooldown between shots to prevent excess barrel overheating combined with its minimal 5 shots per power cell on low power settings. This window for cooldown is even longer when the alternate fire is used. The IL-18A Disruptor Carbine was designed primarily to handle armored targets on the battlefield. Manufactured by the Sith Empire for use by the Imperial Legion, the IL-18A functions primarily as a portable alternative to anti-vehicular weapons such as rockets while still maintaining functionality for use against armored infantry with a low output carbine mode. The IL-18A's production was to streamline battlefield effectiveness for the Imperial Legion, allowing troops to move with better mobility and mitigating the need to carry large, cumbersome rocket launchers or other anti-vehicular weaponry. With that dealt with, the IL-18A is much more ammo efficient compared to rockets as they only require power cells to do as much damage as one to a vehicle, which can be carried in greater quantities compared to rockets. The IL-18A while designed as an anti-vehicular weapon was also engineered to work effectively against infantry units. By utilizing a lower output, the IL-18A was able to fire off a few extra shots before the power cell in use was expended and needed to be replaced. This allowed for versatile use on the battlefield, by granting the user the ability to deal with infantry alongside rifleman, rather than carrying a single purpose heavy weapon. The alternate fire used up an entire power cell to discharge a high powered shot capable of punching through tank armor. To compensate for its energy cell usage, the IL-18A had also sparked the development of a much more effective and efficient manner of use. It started by utilizing Energy Cell Magazines, a series of energy cells locked together in the form of a magazine, specifically designed to the shape of the weapon so that the IL-18A could receive and hold them. The receiver of the IL-18A could extend and retract to eject a spent power cell, whilst simultaneously pushing the next power cell into the receiver and locking it in. This allowed the user to never have to constantly manually replace energy cells to reload the weapon, instead only making it so that they need to discard spent magazines.